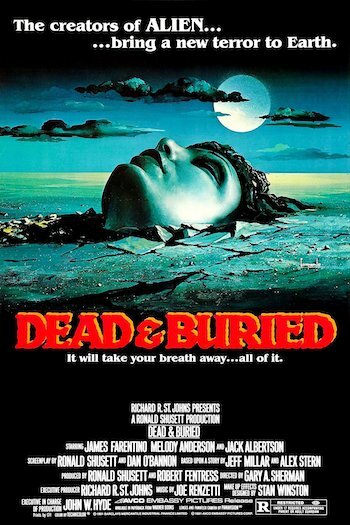 Dead & Buried poses a question that is really almost embarrassingly obvious: What if there was this small town where the guy in charge of the funeral home starting mixing his business with a little voodoo? George is a photographer from St. Louis who has gotten tired of shooting the Arch and the strip clubs across the river and has headed out to Potters Bluff for a little R&R. Potters Bluff is a seaside village on the east coast where somebody like a rube from the Midwest can wander along the sea shore and see stuff like old fishing nets, barrels, and boats all laid out nice and seductive like so that he can photograph them for their layout in Ye Olde Shipping Cliches Photography Monthly. I thought I was watching an Old Spice commercial or something. Then, just when it seemed that this movie was going to be about a photographer finding himself on the shores of a really scenic town, this woman in tight jeans shows up! She decides she’s going to call him Freddie and he says she looks like a Lisa. Dispensing with real names brings to mind all those online flirtations where people use assumed names, except in this case there is actually a female involved. Next thing you know, her top comes off and this guy has suddenly become Elmer Batters! Just when you thought that this vacation of George’s was going to turn into one of those letters to Penthouse though, he gets conked on the head. The townspeople attack and set him on fire. I guess some people just don’t appreciate boudoir photography! The only guy in town interested in investigating things is the local cop. His name is Dan and we learn through some clumsy exposition by other characters that he is a college educated man with a masters degree who came back to his home town to help them out by breaking up their secret voodoo ring. Dan is played by James Farentino and he shows some good fire in the character, getting us to believe that he’s trying to figure out the crazy things going on and that it is all weighing heavily upon him. Meanwhile the village drunk stumbles around at night down by the docks and gets himself and sliced and diced by the townspeople. This makes two murders in the little town of Potters Bluff and instead of calling in the state police or whomever, Dan continues to slog through his half-baked investigation. He does stuff like talk to the motel owner where the victim was staying, getting gossip about his own wife and discovering that she has hidden a book on witchcraft along with a ceremonial dagger in her underwear drawer! Dan’s problems are only beginning though. A family disappears, a mysterious new boy enrolls in Dan’s wife’s grade school, and Dan runs over a guy who grabs his severed arm and runs off into the night! While all this crazy crap is going on and Dan is busy investigating two murders, his wife, Jan asks him to drop some film off at the Photohut and then gets pissed when he forgets to do it. 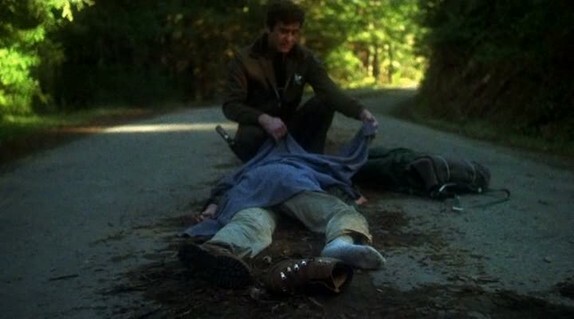 Just because you have a double homicide doesn’t mean that everyone else’s life doesn’t go on, pal! Dead & Buried is pretty creepy in its set up and only starts to lose steam as its lackluster secrets are revealed. Many things about the story remain as hazy as the mist that seems to perpetually hang over every scene. Is the whole town afflicted with this? Just part of it? How do the townspeople react to all these people dying mysteriously and then showing up again? We know that it freaked out the motel owner. Is that the first time that’s ever happened? And if you had the skills of the funeral director, would you really just be content to be a mortician in a hick town? And what’s with everyone taking pictures all the time? 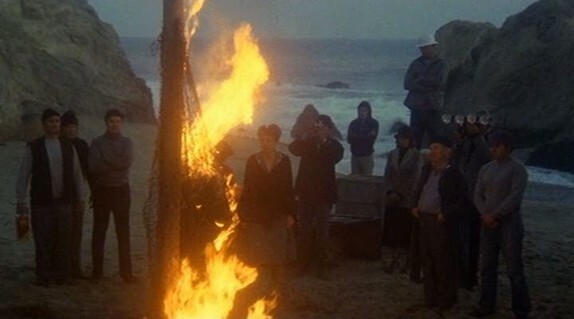 Dead And Buried delivers a fair number of jolts (chiefly due to loud music) and good seaside atmosphere. Farentino is a solid lead though everyone else in the movie has little depth though to be fair, they are just reanimated corpses. There is also a good dose of gore here for those of you that care about stuff like that. Despite the weak ending and the parts of the story that don’t make sense, the mystery of what is happening in Potters Bluff is intriguing and makes it worth a look. Besides, don’t you want to know if Dan remembers to pick up the film from the Photohut?